Sir Charles Kuen Kao, recipient of the 2009 Nobel Prize in Physics, passed away on September 23rd in Hong Kong. Dr. Kao, who was often called the "Father of Fibre Optics", is credited with breakthrough research in the realization of fiber optics as a telecommunications medium in the 1960s while at Standard Telecommunication Laboratories (STL) based in Harlow, UK. He earned his Ph.D. in electrical engineering in 1965 from University College London. 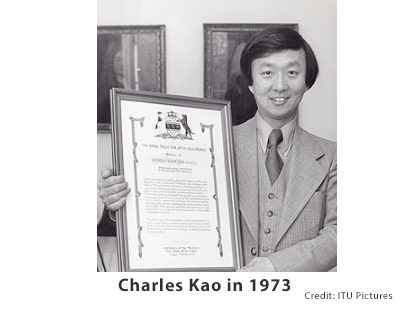 Over his career, Dr. Kao published more than 100 papers and was granted over 30 patents. He was the founder of the Department of Electronics at Chinese University of Hong Kong and later became vice chancellor of the university. In 2010, he was awarded the Most Excellent Order of the British Empire (KBE). The FCC adopted an order aimed at removing regulatory barriers that inhibit the deployment of infrastructure necessary for 5G and other advanced wireless services. In a Declaratory Ruling, the FCC focuses primarily on local fees for the authorizations necessary to deploy small wireless facilities. Specifically, the Declaratory Ruling concludes that state and local governments may not charge fees that "are greater than a reasonable approximation of objectively reasonable costs for processing applications and for managing deployments in the rights-of-way." The ruling sets specific fee levels for small wireless facility deployments that presumably comply with the relevant standard; and provides guidance on when certain state and local non-fee requirements that are allowed, such as aesthetic and undergrounding requirements—may constitute an effective prohibition of service. The second part of the FCC's decision establishes two new shot clocks for small wireless facilities (60 days for collocation on preexisting structures and 90 days for new builds); and codifies the existing 90 and 150 day shot clocks for wireless facility deployments that do not qualify as small cells that were established in 2009. FCC Chairman Ajit Pai stated "To be sure, there are some local governments that don’t like this Order. They would like to continue extracting as much money as possible in fees from the private sector and forcing companies to navigate a maze of regulatory hurdles in order to deploy wireless infrastructure. But these actions are not only unlawful, they’re also short-sighted. They slow the construction of 5G networks and will delay if not prevent the benefits of 5G from reaching American consumers. And let’s also be clear about one thing: When you raise the cost of deploying wireless infrastructure, it is those who live in areas where the investment case is the most marginal—rural areas or lower-income urban areas—who are most at risk of losing out. And I don’t want 5G to widen the digital divide; I want 5G to help close that divide." Dissenting, in part, FCC Commissioner Jessica Rosenworcel writes: "Instead of working with our state and local partners to speed the way to 5G deployment, we cut them out. We tell them that going forward Washington will make choices for them—about which fees are permissible and which are not, about what aesthetic choices are viable and which are not, with complete disregard for the fact that these infrastructure decisions do not work the same in New York, New York and New York, Iowa. So it comes down to this: three unelected officials on this dais are telling state and local leaders all across the country what they can and cannot do in their own backyards. This is extraordinary federal overreach." 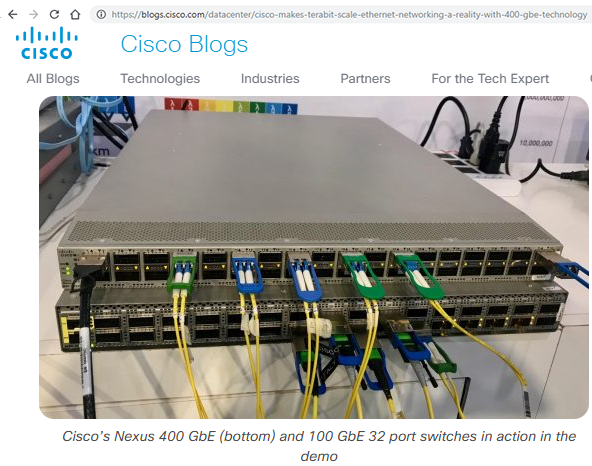 At ECOC 2018. as part of the 100G Lambda multisource agreement (MSA) interoperability demonstration, Cisco demonstrated Nexus 32-port 100 GbE & 400 GbE 1RU switches populated with modules from various manufacturers. In a blog post, Cisco's Mark Nowell writes "It is very exciting that 400 GbE is now becoming available for testing, deployment, and adoption by network operators, paving the way for Terabit Scale Ethernet being a mainstream technology. There will be many more announcements in the future but it is important to mark this key milestone!" At ECOC 2018, EXFO unveiled a new 400G test module featuring its Open Transceiver System (OTS), which is a modular design concept that enables compatibility between current or future high-speed transceivers and EXFO's test platforms (lab and field). 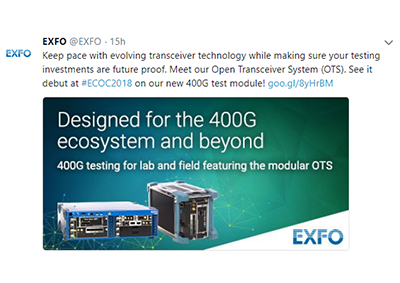 EXFO said inserts to test specific transceiver types, including those used in 400G systems (e.g., QSFP-DD, OSFP, COBO, and CFP8), eliminate the need to replace entire testing modules and can be interchanged directly in the lab, out in the field or on the production floor. The OTS debuts on the new FTBx-88460 Power Blazer: a compact testing solution that supports all of today's latest high-speed ecosystem technologies (400G, FlexE and OTUCn/FlexO) and transceivers on a single module. "We are proud of our position at the core of the 400G ecosystem—demonstrated by our participation alongside key industry partners in important interoperability events at ECOC," said Stéphane Chabot, EXFO's Vice President, Test and Measurement. 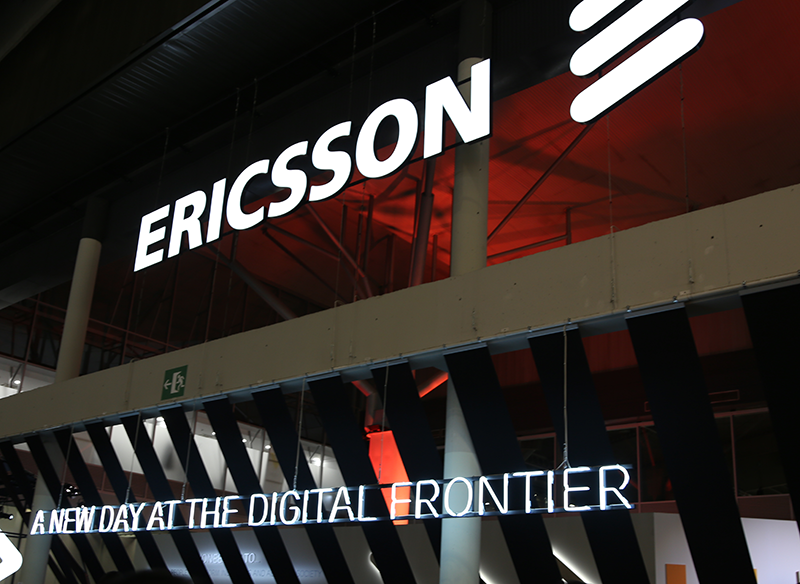 "These activities, strategic relationships and new innovations contribute to our goal of delivering smart solutions that help our customers get the most from their testing investments while staying ahead of the 400G curve." "Xilinx is pleased to partner with the EXFO team in a FlexE (Flex Ethernet) interoperability demonstration taking place during ECOC 2018. The Xilinx leadership FlexE solution combined with the EXFO test platform leadership clearly show that the FlexE and 400G ecosystem is mature and ready for production. FlexE is becoming an increasingly important component of the network evolution. Proven interoperability between Xilinx's leading FPGA, FlexE IP and design platform and EXFO's test and measurement products provide confidence to our customer base", said Farhad Shafai, Vice President Communications Markets, Xilinx. At ECOC 2018, Sicoya held private demonstrations of one chip 100G solutions based on its SETR-CDR-E100 Silicon Photonic Engine, which integrates CDRs, TIAs, drivers, modulators, and PINs. The engine enables QSFP28 transceivers using chip on board assembly technology or embedded optical modules utilizing Sicoya's optical ASIC packaging solution. a 100G Embedded Optical Module (EOM) that comes in a 20x20mm BGA ASIC package. The EOM can be soldered to the main board and is optically pluggable utilizing Sicoyas optical connector system. sampling of the SETR-E400 monolithically integrated Silicon Photonic 400G DR4 engine along with the SIGT-I200 400Gb/s PAM4 Gearbox starts in Q4 2018 to selected partners. Sicoya, founded in January 2015, is a spin-off from TU Berlin based on continuous R&D in Silicon Photonics since 2007. At ECOC 2018, ColorChip showcased its portfolion of optical transceivers ranging from 40 to 400G. During the exhibition, ColorChip demonstrated a new family of 100G-400G PAM4 optical transceivers, including 100G Single-Lambda PAM4 QSFP28, 200G FR4 (2km) and LR4 (10km) QSFP56 and 400G QSFP56-DD DR4/FR4 transceivers, built with power efficient uncooled DML/EML-based CWDM4 optical engines. ColorChip's CEO, Yigal Ezra, commented: "Today we are proud to announce the availability of 200G QSFP56 FR4 beta samples and expect to have 400G DR4/FR4 samples available in Q4, proving once again our commitment to spearhead innovative optical interconnect solutions that will further advance a truly connected world". At ECOC 2018, MaxLinear introduced a 100 Gbps transceiver with integrated driver. MaxLinear’s new MxL93512 is part of the Telluride family of devices, which are DSP SoCs with integrated electro-absorption modulated laser (EA-EML) drivers for 100 Gbps/400 Gbps optical interconnects. The new device allows optical module vendors to develop a 100 Gbps optical interconnect module in a compact form factor for intra-datacenter applications with a transmission distance up to 2 Kilometers. The MxL9351x SoCs are suitable for use within QSFP28 module form factors. Two options are currently available: the MxL93512 that integrates an EA-EML driver with 1.8V PP SE swing, and the MxL93513 that offers differential 800mV peak-to-peak swing for non EA-EML-based optics. Maxlinear said its Telluride family features several operating modes that can connect to multiple generations of switch ASICs (128x25G NRZ, 256x25G NRZ or 256x50G PAM4) enabling 3.2Tbps, 6.4Tbps or 12.8Tbps front panel capacity per data center rack unit. These different operating modes span a variety of optical module form factors such as QSFP28, SFP-DD, QSFP-DD, OSFP and COBO. MaxLinear also announced support for 400 Gbps breakout mode clocking in its MxL9354x products. The functionality will be on display at the company’s stand (#684) at the European Conference on Optical Communication (ECOC) in Rome taking place from Sept. 24-26, 2018. MaxLinear’s Telluride 400 Gbps PAM4 DSP (MxL9354x), based on 100 Gbps single lambda technology, is enabling development of DR4 and FR4 optical modules for the upcoming hyperscale datacenter transition to 400 Gbps. The initial use case in this transition is expected to be dominated by use of 400 Gbps DR4 modules used in a breakout application. The breakout mode of a 400 Gbps DR4 module requires certain clocking considerations that allow for the four 100 Gbps lanes to be treated as independent 100 Gbps ports and connect to a 100 Gbps DR1 or FR1 module on the other side. The unique clocking architecture of the MxL9354x makes it possible to achieve this requirement seamlessly.